There was a time when the Nektan Platform appeared to be more of a production line, creating and serving out near identical sites on a seemingly weekly basis, just with a slightly different design concept at each. However, it appears those days are behind Nektan, and sites like Monster Casino feel much more standalone, which is nice. However, just feeling different isn’t enough, especially not when you consider how many competitors there already were on the market before Monster Casino even landed. Launches in late 2016, and perhaps somewhat lost in the shuffle due to some big releases at the beginning of this year, Monster Casino has been on an uphill struggle from the outset, so it needs more than just being different than its Nektan brethren in order to stand out. What becomes clear when considering this, is that a lot of work needs to go into a site for it to stand a chance, has this happened here? or is Nektan still painting-by-numbers, just being subtler about it? It is always an odd thing, when something that is designed for adults takes inspiration for something that was so clearly designed for children, but that’s exactly what happens here. To be fair, Pixar appeals to adults too, but it’s target audience is very much the younger generation, so designing the mascot for Monster Casino, who also takes the place of the ‘o’ in the logo, based so obviously on the character of Mike from Monsters Inc is a little odd. Either way, this small, green, round, one-eyed monster is cute enough, and creates a fun feel to the site from your very first visit. Scan past the yellow and green colour scheme at the top of the homepage, and you will find a plethora of thumbnails that will take you straight to the most popular games at the site with one click, a tool that has proven both popular and successful at most new sites. The black background behind these thumbnails allows the design work of the games themselves to create the colour scheme here, which is effective and attractive. 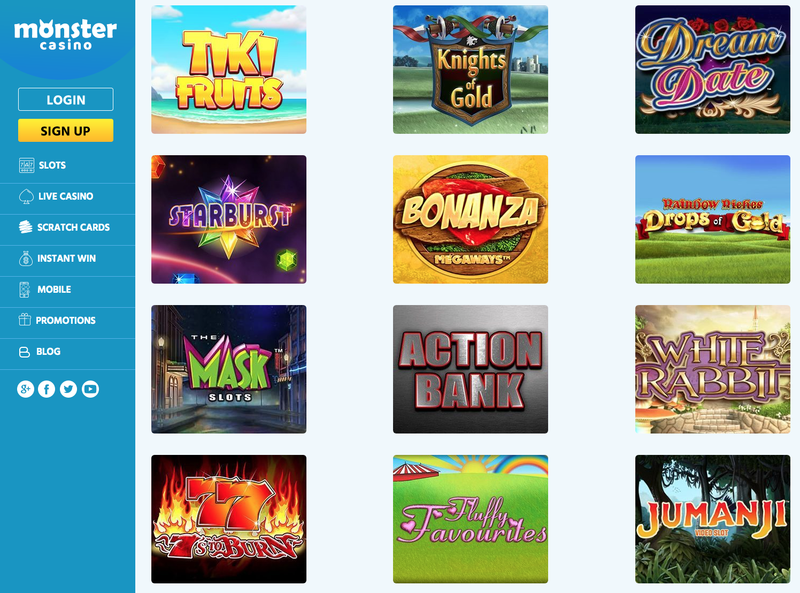 This isn’t the most unique look for a site, and the bits that are unique for a casino site have essentially been unceremoniously lifted from Pixar movies, but it looks pretty good all the same. If a new site is going to find a decent sized audience amongst the mass of online casino players there are, it needs to offer variety in its games. one way to do that is with a range of different software developers providing your titles, and with ELK Studios, IGT, Microgaming, NEKTAN, Net Entertainment, NextGen Gaming, and WMS Gaming supplying the games here, monster Casino does a fair job of that. The second is by offering variation in game type, and you get that here too, with video slots, table and card games, and scratch cards all available, on mobile as well as desktop. You’ll also find variety within these categories, slots range from the classic to the brand new, blackjack, poker, and more come in many forms, there’s a lot to love about the gaming options here. The ultimate question, however, is this, is it enough? The answer to that is basically maybe. This isn’t a show stopping site, but it has some excellent features, time will tell whether it is sufficiently tempting to players.